This article will discuss the illegality of refugee caps under international law. The first section will discuss the binding customary principles of non-refoulement and the right to seek asylum. The second section uses the United States’ and Austria’s attempt to cap refugees to explore the inconsistency of refugee caps in international law, while the third section will argue why a plain-language reading of the principle of non-refoulement is unreasonable. Finally, this paper explains that working together provides a way for countries to find relief from the burden of mass migration. 552,200 people were returned to their homes, often in dangerous conditions, while countries admitted only 189,300 for resettlement. Developing countries have the highest migration rates, but also overwhelmingly bear the burden of accepting migrants. In 2016, the top six countries hosting the highest number of refugees are all developing countries. Turkey hosted the highest number for the third year in a row at 2.9 million, while Lebanon had the highest number of refugees relative to its population with one refugee for every six people. Developed countries, however, remain reluctant to receive refugees. Responses to the growing number of migrants and refugees are alarming. Many countries are responding to the crisis by placing caps on the number of refugees allowed into the country on any given day, month, or year. President Trump’s “travel ban” not only limited who could enter the U.S., but also capped the number of refugees it would allow to enter the country at 50,000 for the year 2017. Equally controversial, in 2016, Austria announced it would place a cap on the number of refugees allowed to apply for asylum or pass through the country each day. Though the European Union warned Austria that the cap would violate international law, Austria only cancelled their plan to cap refugees because the number of refugees decreased. The legality of these actions is questionable. The United States’ Ninth Circuit Court of Appeals recently ruled that there was no justification for the Executive Order’s cap on refugees, holding that allowing more than 50,000 refugees would not be detrimental to the United States, a precondition for capping refugee numbers. The European Commission criticized Austria, claiming that it had an obligation to accept refugees and to do otherwise would violate the Geneva Convention. Countries do in fact have obligations to refugees under international law and refugee caps appear to contradict those obligations. However, with on-going wars, terrorism, and climate change, as well as the steadily increasing number of migrants, countries will continue to attempt to implement measures like refugee caps, as the “migrant crisis” is unlikely to go away anytime soon. The most important instrument regarding refugees under international law is the 1951 Convention on the Status of Refugees. One of the fundamental principles laid out by the Refugee Convention is the principle of non-refoulement, stating that no country may “expel or return. . . a refugee in any manner whatsoever to the frontiers of territories where his life or freedom would be threatened on account of his race, religion, nationality, membership of a particular social group or political opinion.” The principle of non-refoulement is customary international law, meaning even those states which are not parties to the Refugee Convention, or its 1967 Protocol, are obligated to abide by the principle. The principle of non-refoulement is also non-derogable, meaning that there 1V0-603 are no exceptions where a state may refuse to comply with the principle. However, as a whole, the international community disagrees with this assessment. While the Refugee Convention allows states to suspend certain rights of refugees in very rare cases, this exception only applies “in time of war or other grave and exceptional circumstances.” This exception does not include economic concerns, concerns over public order, or national security. Further, there is criticism of the idea that refugees are only protected when physically in a country. The principle of non-refoulement today is generally understood to include the obligation to not reject refugees at the border. In 1981, the UNHCR explained that non-refoulement “must be scrupulously observed” and included non-rejection at the border. These obligations to refugees and asylum seekers applies even in cases of mass migration influx. A plain language interpretation of the Refugee Convention also leads to an absurd result. If non-refoulement applies only to those already in the country, seemingly every country could take the stance to cap the number of refugees each year, either stranding millions of refugees and asylum seekers in limbo or sending them back into danger by forcing them to return home. The right to leave one’s country and the right to seek asylum also lead to a necessity of receiving, and not rejecting or capping refugees and asylum seekers. If countries can place caps on refugees, an asylum seeker may never be able to utilize his or her right to seek asylum, for there would be no one willing to review the application. The idea that countries can essentially ignore the obligation of non-refoulement and the right to seek asylum by refusing to accept any refugees would render both the Refugee Convention and the customary norm meaningless. Regardless of the arguments against non-rejection, the actions of developed countries like the United States and Austria imply that they do in fact consider there to be a right of non-refoulement as well as a right to seek asylum. Developing countries routinely bear the weight of the refugees their developed neighbors are unwilling to take. In fact, the United States and the European Union expect other countries to prevent refugees from crossing their shared borders. In response to a massive influx of migrants from Central America, President Obama pressured the Mexican government to increase its border security in order to help curb the flow of migrants into the United States. Similarly, the European Union provides aid to Turkey in return for Turkey’s help to reduce the number of refugees that might otherwise make their way to the European Union. These expectations are simply examples of pushing other countries to take on a higher burden in the refugee crisis while limiting their own obligations towards refugees. Helping other countries provide assistance to refugees implies that countries like the United States realize that refugees are entitled to protections, but that they do not want to fulfill that obligation themselves. Expecting other, usually less developed countries, to take on the obligations of developed countries, makes developed countries appear as though they are exempt from their international obligations. Though potentially burdensome, the principle of non-refoulement and the right to seek asylum are essential to the protection of millions of refugees around the world. Even if countries experience strain on their infrastructure, the principle of non-refoulement is non-derogable. To allow derogations would render a country’s obligations towards refugees and asylum seekers meaningless. Because of the great strain on a country hosting a large number of refugees, international cooperation is not only recommended, but essential. It is only possible to manage the refugee crisis when countries work together in solidarity. Countries must recognize this immediately, because as the number of migrants grows, the more difficult it becomes for any individual country to bear the burden. Ali Sheets is a 2L at the University of Denver Sturm College of Law and a staff editor on the Denver Journal of International Law and Policy. U.N. High Comm’r on Refugees, Global Trends Report: Forced Displacement in 2016, at 2, June 19, 2017, http://www.unhcr.org/5943e8a34 [hereinafter Global Trends Report]. Exec. Order No. 13769, 82 C.F.R. 8977 (Jan. 27, 2017), https://www.gpo.gov/fdsys/pkg/FR-2017-02-01/pdf/2017-02281.pdf [hereinafter EO1]; replaced by Exec. Order No. 13780, 82 C.F.R. 13209 (March 6, 2017) https://www.gpo.gov/fdsys/pkg/FR-2017-03-09/pdf/2017-04837.pdf [hereinafter EO2]. Duncan Robinson, EU says Austria asylum move breaches Geneva Convention, Financial Times (Feb. 18, 2018), https://www.ft.com/content/a415ef60-d651-11e5-829b-8564e7528e54. Hawaii v. Trump, 859 F. 3d 741, 776 (9th Cir. 2017). Convention Relating to the Status of Refugees, July 8, 1951, 189 U.N.T.S. 137 [hereinafter Refugee Convention]. Protocol Related to the Status of Refugees, Jan. 31, 1967, 606 U.N.T.S. 267. The 1967 Protocol also binds parties to the Refugee Convention. U.N. High Comm’r on Refugees, Advisory Opinion on the Extraterritorial Application of Non-Refoulement Obligations under the 1951 Convention relating to the Status of Refugees and its 1967 Protocol, ¶ 15, June 26, 2007, http://www.unhcr.org/4d9486929.pdf [hereinafter Advisory Opinion]. Roman Boed, The State of the Right of Asylum in International Law, 5 Duke J. of Comp. & Int’l Law 1, 23 (1994). International Covenant on Civil and Political Rights, art. 12, Dec. 16, 1966, 999 U.N.T.S. 171 [hereinafter ICCPR]. Conclusion on the Civilian and Humanitarian Character of Asylum No. 94(LIII), UNHCR Executive Comm. of the High Comm’r Programme on its Fifty-Third Session, U.N. Doc. A/AC.96/973 (2002), http://wwwunhcr.org/refworld/ docid/3dafdd7c4.html. EO2, supra note 5, at Sec. 6. Sale v. Haitian Centeres Council, Inc., 509 U.S. 155, 187 (1993). Refugee Convention, supra note 10, at art. 31. James C. Hathaway & Anne K. Cusick, Refugee Rights Are Not Negotiable, 14 Geo. Immgr. L. J. 481, 491 (2000). Katy Long, No Entry! A review of UNHCR’s response to border closures in situations of mass refugee influx, ¶ 67, UNHCR, PDES/2010/07, Policy Development and Evaluation Service (June 2010), http://www.unhcr.org/4c207bd59.pdf. Protection of Asylum-Seekers in Situations of Large-Scale Influx Protection of Asylum-Seekers in Situations of Large-Scale Influx No. 22 (XXXII), at II(A)(2), UNHCR Executive Comm. of the High Comm’r Programme on its Thirty-Second Session, U.N. Doc. 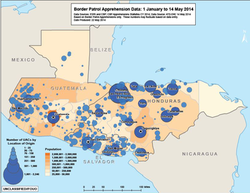 A/36/12/Add.1 (1981), http://www.unhcr.org/en-us/excom/exconc/3ae68c6e10/protection-asylum-seekers-situations-large-scale-influx.html [hereinafter Protection of Asylum Seekers]. Organization of American States, Cartagena Declaration on Refugees, Nov. 22, 1984, at III(5), Annual Report of the Inter-American Commission on Human Rights, OAS Doc. OEA/Ser.L/V/II.66/doc.10, https://www.oas.org/dil/1984_cartagena_declaration_on_refugees.pdf. OAU Convention Governing Specific Aspects of Refugee Problems in Africa, art. II(3), Sept. 10, 1969, 1001 U.N.T.S. 45. Refugee Convention, supra note 10, at art. 33; see also Advisory Opinion, supra note 13, at ¶ 7. Elizabeth Collett, The Paradox of the EU-Turkey Refugee Deal, Migration Policy Institute (March 2016), http://www.migrationpolicy.org/news/paradox-eu-turkey-refugee-deal. Protection of Asylum Seekers, supra note 26, at II(A). Pablo Antonio Fernandez-Sanchez, The Interplay between International Humanitarian Law and Refugee Law, 1 J. Int’l Human. Legal Stud. 329, 381 (2010).